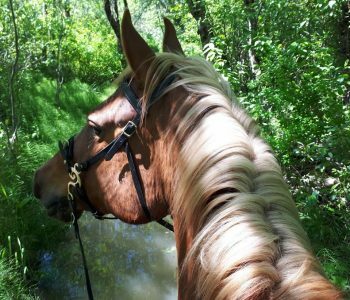 A writer, artist, musician, traveler and horsewoman, Kera discovered the field of Equine Guided Learning (EFL), and spent 3 years rewilding her equestrian education with the help of a feral Percheron mare. In 2010 she completed a Facilitator of Equine Experiential Learning Certificate through Horse Spirit Connections, which combined the Epona approach with shamanic studies. She continued her exploration of the liminal edge between human, animal and nature with ecopsychologist David Abram, mycologist Paul Stamets, TTouch founder Linda Tellington Jones, and dreamworker/translator of the subconscious Toko Pa Turner. After years of supporting Autistic/neurodiverse children privately and as a Special Education/Class Assistant at the Whistler Waldorf School, Kera knew she needed to find a way to work with these individuals on horseback and in nature, so she completed a 600 hour apprenticeship and 4 levels of certification in Horse Boy Method- a cutting edge evolution of therapeutic riding specific to Autism and neurological diversity. You can experience her unique offerings at Mountain Horse School.